Season 4 is the last for Star Wars Rebels. The popular show on Disney XD is coming to an end. Revealing the hidden history between Revenge of the Sith and A New Hope, Rebels has provided excellent storytelling that engages both new and old fans of the Star Wars universe. Through the lens of the series we’ve seen what happened to Ahsoka Tano, her final (?) confrontation with her former master who is now Darth Vader, the emergence of Princess Leia as a Rebel leader, the origin story of Wedge Antilles, the reappearance of Captain Rex, the death of Maul, the revelation of Obi Wan Kenobi, and so much more. But more importantly, we have come to know and love a whole new group of characters from the Star Wars saga. 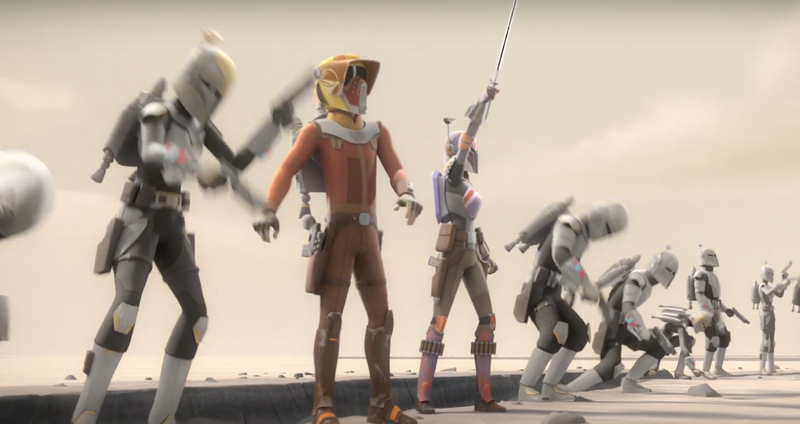 The makeshift family of Ezra, Hera, Kanan, Sabine, Zeb, and Chopper went from being one tiny cell of rebels to part of a larger movement. In that journey, we have watched them mature, grow, and become an integral part of the Star Wars family. That’s why the announcement at Star Wars Celebration 2017 was such a shock. Dave Filoni, Executive Producer and guiding hand of the show, revealed to a stunned audience that the upcoming season would be the show’s swan song. He shared, “I firmly believe that each generation needs to have their own piece of Star Wars and I feel that this show for a lot of kids growing up with it is very much a part of Star Wars as any of the movies… I know it’s tough. It’s tough for me but believe me I know what it’s like when I don’t get to end a series. And what happens is you end up making t-shirts and it wasn’t as fun.” He said this wasn’t the end of what’s being done in animation but this show was heading right where it was intended to be. He and the cast did offer some reveals for what’s to come in the last 15 episodes of Star Wars Rebels. “You’ll see in Season 4, it’s unlike anything we’ve ever done. It’s going to be different, a little dark, a little fun…” Dave shared that Genevieve O’Reilly would return as Rebel leader Mon Mothma as would Forrest Whitaker reprising his role of Saw Gerrera. Agent Kallas undergoes a transformation and joins the fight more directly (and reportedly is now known as #HotKallas on Twitter). The Mandalorians come back in force including Bo-Katan Kryze. But perhaps the biggest surprise was Warwick Davis joining the cast as Rukh, Grand Admiral Thrawn’s bodyguard. Warwick is known most famously for his role as Wicket the Ewok in Return of the Jedi but has long been part of the Star Wars family. He has played roles in The Phantom Menace, The Force Awakens, Rogue One, and reportedly in the upcoming Star Wars: The Last Jedi. Now, he adds his talent to the Rebels corner of the universe. To be sure, there are always surprises Dave won’t reveal – like the final fate of the Ghost family. But that’s part of the fun. I can’t wait for Rebels to return, but at the same time will dearly miss this well-loved corner of the Star Wars universe.